It has been a while since I shared a recipe and this is a good one! I usually make these to include on my Christmas cookie tray that we give friends. 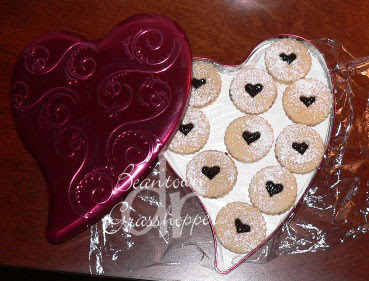 This year I never got around to making cookie trays and planned to do something for Valentine's day. That didn't happen either. However, my son helped to make some because he wanted to give a tin to his girlfriend that night. In a small bowl, combine flour, baking powder, salt and cinnamon; set aside. In a large bowl, beat sugar and butter until creamy. Beat in eggs and almond extract. Gradually beat in flour mixture. Divide dough in half. Wrap in plastic wrap; refrigerate until firm. Recently, there was a blog hop. Life has been pretty crazy lately so I frequently skip blog hops right now but I looked this time. I was looking for a small thank you for teachers and leaders at church. I ended up making 32 match boxes for them. However, finishing in the wee hours of the morning and needing to get a little over an hour of sleep before I had to be up for church, I skipped the picture of that project. I digress . . . I came across this sweet little package on Lisa Young's blog and knew I had to make it. I made a few to hand out at a meeting I had on Valentine's Day and my son liked it so much that he wanted one to give his girlfriend. 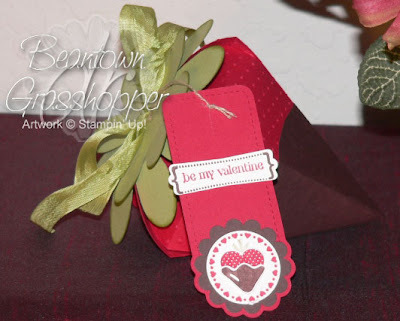 Cut 3 pieces of real red and chocolate chip using the petal cone die. On one piece, cut off the panel without the tab. When they are connected, you should have 5 panels instead of 6. When my husband travels, I tend to manage my time better and I keep up with everything a little better because I know it's just me to get it done and if I procrastinate . . . well, it wouldn't be a pretty picture. It is amazing how much 4 kids can still leave around as teens/tweens. While I have been managing time pretty well, stamping had to be put aside during the holidays and for an early "spring cleaning". I'm hoping to get back into it a little at a time, but I know other things are going to occupy my time. Happy news is we reached 6 mos. (1/2 way) for my husband's deployment last week. Next month he will be home for his R&R and then he heads back to finish out his year.